Published in VAULT: Australiasian Art & Culture, Issue 3, 2013. The ‘Malboro Man’ advertisements of the 1950s – featuring masculine cowboys, stately horses and epic landscapes – are considered to be one of the most successful campaigns of all time. In the 1980s, American artist Richard Prince began translating these Malboro advertisements into works of art through rephotographing, cropping, and manipulating techniques. In 2005 Prince became the first artist to sell a photograph for a million dollars, and this notoriety prompted Sam Abell – the editorial photographer who originally shot the Malboro image – to publicly label Prince a plagiarist. 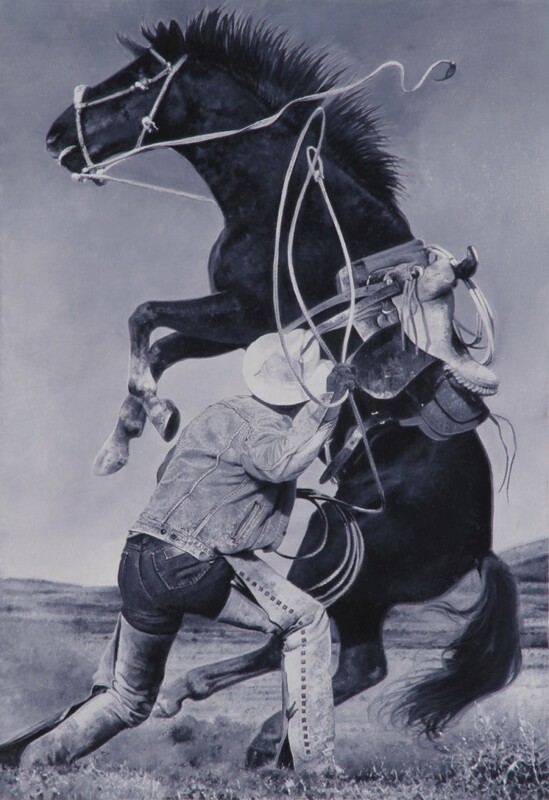 Now, more than a decade later, Michael Zavros, one of Australia’s most influential mid-career painters, spins a modern rope around this legendary campaign for his latest series, ‘The Prince’ – currently on show at Rockhampton Art Gallery in Queensland. The artist talks to VAULT about his process. In ‘The Prince’, you have re-authored (Zavros) the appropriation (Prince) of an original copy (Abell) based on a fantasy (Malboro Man). In so doing, you have created a new gravity for these already-doctored works, and have enriched a legend that was fabricated to begin with. What was the reason behind ‘The Prince’? I’m aware of a debate surrounding my work regarding issues of criticality and intentionality, and retrospectively the same questions arise around Richard Prince. I wanted to champion this in redrawing and repainting these epic icons of postmodernism and appropriation. Prince emptied the smoking campaign from the image of the American cowboy and I’ve emptied Prince from the rephotographed image. With the passage of time and the vanishing of cigarette advertising, what we’re left with are these incredibly beautiful, romantic images of the fictional Marlboro country. Why did you choose Rockhampton and Griffith University to stage this momentous show? And what was it like to collaborate with Tracy Cooper-Lavery (Rockhampton Art Gallery) and Simon Wright (Griffith University Art Gallery)? Tracy Cooper-Lavery had seen the first few Prince works when she accepted the directorship at Rockhampton Art Gallery. It was her idea to bring this new series to Australia’s beef country [Rockhampton], and to see these images of the American mid-west in Australia’s cowboy country. The whole point of these new works is about meaning shifting and changing, being lost and born anew. A regional audience might embrace the works differently to metropolitan one. It’s been fantastic working with Tracy. She’s that can-do style director/curator where nothing is impossible, and Rockhampton Art Gallery is exemplary of the great things happening in regional Australia. I’m also excited to bring The Prince to Griffith University Art Gallery, where I did a Bachelor of Fine Art at Griffith University/Queensland College of Art in Brisbane. I also felt it was important to collaborate with Simon Wright on the project because he’d bought the first Prince/Zavros work at Art Hong Kong 2011 for the Griffith University Art Collection. You work with traditional media – oils, charcoal, and cast bronze – to explore concepts and ideals that have a ‘nowness’ element and neological aesthetic — at the same time an antiquated romance lingers. What drives this? In terms of media, it’s not a deliberate engagement with tradition, it’s just that oil paint or watercolour or charcoal are for me, still the best vehicles for expression. I can manipulate this media to reflect my subject matter, the luxury, the seduction, the decadence of what I’m painting. You have included some older works in The Prince, such as the TV paintings of John Travolta, Madonna, and Betty White. What was the crux here? The inclusion of these works mirrors Prince’s interest in celebrity and idolatry. I made these works shortly after I finished art school in the late nineties. I didn’t have a job. I didn’t know what to do with my life yet, and after graduating, making art wasn’t making sense to me. Routine became important to me, and every morning at nine o’clock repeats of The Golden Girls would be on TV. It became this wonderful, prosaic pastel thing that would ease me into my day. It brought with it a deep nostalgia for the 1980’s and my family. I painted both Travolta and Betty White in 1998, and Madonna in 2002, all from television stills. I started taking photographs of the television screen, playing with the pause button to freeze frames so that I could capture the flickers and static disruptions. They offer the gesture of video, painted. They act like these indicators to that era, and imbue the work with nostalgia. This was a time where I was really experimenting with different ways of applying paint, and I wanted to include those works in the show. Yes, they are this funny group of stars that have had this weird longevity. Cool/uncool/cool, like painting. Betty White was the only Golden Girl I painted, and she’s the only one still alive. And now she’s just had this resurgence as a cult figure. I am also fascinated by fashion magazines – of which I have many – created by these nameless people presenting us with goods, these anonymous arbiters of taste. I explored this idea in the vignettes for the works in Suit Suite, which I have included in The Prince in a different configuration to that which I presented at Sydney’s Museum of Contemporary Art in 2000. These works always exclude the model, or the identity of the model. And even when they are exposed, it doesn’t actually matter. The man beneath the clothes is of no interest at all. I was never interested in creating a dialogue about masculinity per se. So, I took it a step further by removing the thing that we supposedly covet – the beauty of youth – the thing that gives this figure currency, or cultural potency. In later work, such as the Debaser series I revisited some of those ideas, deliberately erasing my own gestures and negating the beauty of the subjects. For ‘Artists Choice: Michael Zavros,’ which opens later this month, Queensland Art Gallery invited you to curate an exhibition using works from the Gallery’s Collection. Drawing on your 2008 work, ‘Unicorn in the Anticamera’, as a foundation, you employed this editorial-like process of selecting artworks and objects of interest, and then reactivating them in a domesticated setting. Can you tell us why you chose this dioramic process? And what can audiences expect from the show, and its seven themed rooms? When QAG offered me the project, I decided straight away that I didn’t want to become a curator, but of course, as soon as you start making choices then you are curating. But I wanted to somehow retain my role as an artist, and to actually try and make an artwork with the Collection. The resultant exhibition consists of 3-dimensional evocations of the tableaux I create in my own work. Here, I’m creating a series of fictional domestic spaces within one large gallery space, asking, what does it mean to cast these very familiar works in a suddenly domestic place? Quite literally, I’m interior-decoratoring, and employing notions of taste, as opposed to curating in any ‘critical’ way. The ‘Artist’s Choice’ series is a wonderful initiative, because it allows for an artist to do what gallery curators can’t or wouldn’t do, and in doing so perhaps breathe new life into the collection, and open our eyes to new ways of seeing the same work. I really wanted to work across the entire Collection – historical to contemporary – and utilise the gallery’s vast holdings of furniture and object. I also worked closely with the Queensland Museum, who granted me access to their taxidermy and other specimen. Speaking of taxidermy, your Brisbane home – with its Jumanji-like collection of taxidermy animals – was recently featured on Australia’s most famous design blog, The Design Files. As an artist who grew up with animals, and who frequently parades them in his work, what were your thoughts about the comments the blog received in response to the stuffed animals? My love of collecting taxidermy is often misread. The negative comments our house attracted were perhaps more a measure of contemporary culture’s anonymous vitriolic voice, a characteristic of the web, rather than evidence of popular opinion. It is interesting that someone might choose to express such a forceful, hateful opinion in that forum. It strikes me as sort of intolerant. The criticism was leveled at the killing of animals, as though I had killed them myself. Even a cursory investigation of me would have arrived at my practice that addresses trophies – making analogies between collectible art and hunting trophies. I collect only antique taxidermy, and I am very cognisant of illicit practices that have fostered the current state of emergency we are witnessing regarding elephants and rhino, for example. But that’s the subject of another interview! Is there an item that you have been trying to hunt down, or that you pang to own? I’ve always wanted to own a narwhal tooth. I’ve had this fascination with narwhals, and we found one in the Queensland Museum that we could use for the Artist’s Choice show. The only work in the exhibition by me is a small work on board of an interior of a private palazzo in Rome called Palazzo Sacchetti that has as its centrepiece a narwhal tooth reimagined as a unicorn. A few months ago I was given access to the Palazzo while on the Bulgari residency in Rome. It was a private tour with an incredible art historian, Filippo Cosmelli. Speaking of the Bulgari Art Award, of which you were the inaugural recipient, you have also won major art awards such as the Doug Moran National Portrait Prize and the Museum of Contemporary Art Primavera Collex Prize, as well as several drawing prizes. How has winning these accolades and prizes affected your career? Prizes attract a lot of attention and of course help to build a profile, and they amount to professional approbation when they are awarded by a peer or a respected artsworker. It was a lovely surprise to receive a call telling me about this new prize [The Bulgari Art award] that a major state gallery had decided to spend significant funds acquiring my work. It was such a wonderful professional endorsement. And then too, sometimes art prizes are a kind of lottery. Having been a judge too, it amazes me how difficult the process of selecting a winner can be. It’s a fraught process. The painting you produced for the Bulgari Art Award acquisition, ‘The new Round Room,’ is set within the interiors of the Grand Trianon, on the grounds of the Chateau at Versailles. There is something both extravagant and isolating about this piece, yes? I wanted to create something that had a post-apocalyptic feel. Something that was joyous and celebratory and glittery, but also at the same time ominous, with an air of foreboding. Seeing this painting made me think of that scene in the film ‘Children of Men,’ where Clive Owen’s character visits his cousin, a curator of a repository for salvaged art. The world seemed to be descending into this dystopian mess, yet his cousin still maintained this regality, if not denial, by surrounding himself with coveted art and objects. Have you seen the movie? Yes, I’ve seen it, so funny you should say that. My work doesn’t make reference to the film specifically, but those were my thoughts. I was intrigued with the idea that here is humanity going to hell and this despot feels compelled to collect history’s greatest hits out of vanity or for a posterity that is impossible. For The new Round Room I cast myself as the new Sun King occupying and decorating the strange theme park that is Versailles. So there is the incongruous placement of a weight-lifting bench within an elegant salon looking on to a garden: a folly within a folly. It’s an extension of a large scale work I made in 2010, entitled Echo. Ava Gardner, an American actress from Hollywood’s Golden Era, famously said: “Deep down, I’m pretty superficial.” And this reminds me of the way your works celebrate the patina and elementariness of beauty and narcissism. That quote is fantastic. I think that the impenetrable veneer, characteristic of my oil paintings affects a cool distance, as does my subject matter, so that there is the seduction of surface. I often think about way perfume ‘works’. Perfume reviewers talk about how something first appears, then settles, and then becomes something else. There are the opening top notes, then base notes, the dry down. I often think about my work in this way. It doesn’t bother me that a lot of people don’t get past the surface of my work, because that’s also what my work is about. I’m about to get working on something a bit left of centre for me – a portrait commissioned by the Australian War Memorial of Victoria Cross recipient Ben Roberts- Smith. Image: Prince/Zavros 8 2012 oil on board 30.0 x 20.6 cm Long term loan from the artist 2012. Proposed gift to Rockhampton Art Gallery under the Australian Government’s Cultural Gifts Program. Image courtesy of Michael Zavros.